EPISODE 21 OF GHOSTBOX RADIO IS NOW AVAILABLE! This week we were excited for the return of Brach Morin! If you are a fan of the Paranormal, you maybe want to know how you can see what other Paranormal investigators are doing besides the folks on TV. 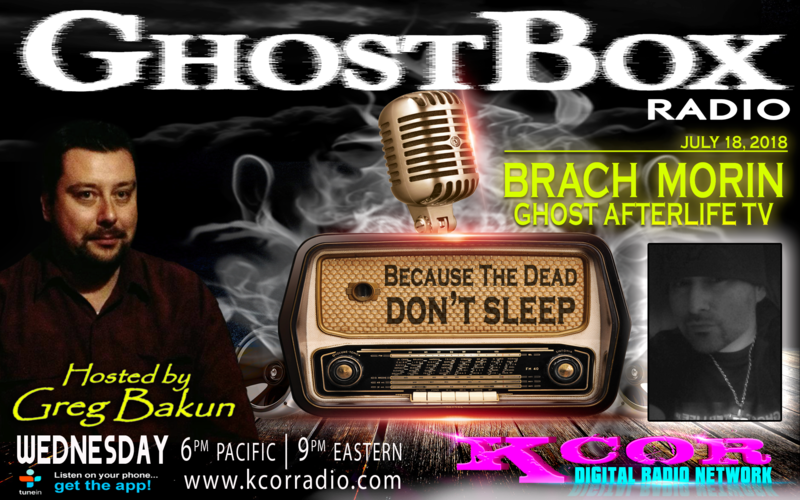 Brach has spent years, literally years, developing his site Ghost After Life TV. It’s not only to see what other investigators are doing but how you as an investigator can share your work. We also had a discussion on the concept of Para-Unity and does it really exist? Click HERE to listen to our episode with Brach Morin! Enjoy! 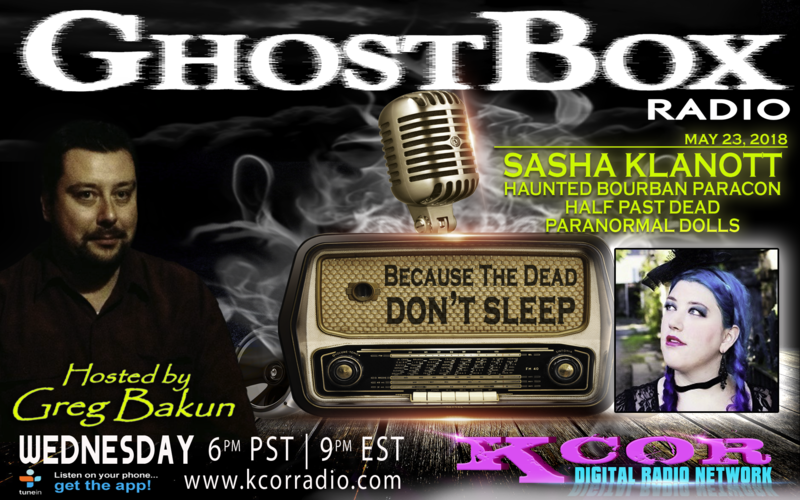 Previous episodes of GhostBox Radio and list of upcoming guests can be found HERE. EPISODE 20 OF GHOSTBOX RADIO IS NOW AVAILABLE! This week we spoke with Rich Newman, Author of Ghosts of the Civil War! Based in Tennessee, Rich Newman has been investigating the paranormal for over ten years and is the founder of the group Paranormal Inc. His articles have appeared in Haunted Times and Paranormal Underground. Tonight we talk about his book through Llewellyn Publishing Ghosts of the Civil War. It was a fantastic conversation. To purchase Rich’s book, please click on this LINK. Click HERE to listen to our episode with Rich Newman! Enjoy! EPISODE 19 OF GHOSTBOX RADIO IS NOW AVAILABLE! We couldn’t wait to have a conversation with Tony Spera! Tony is the son-in-law to Ed & Lorraine Warren, Director of The New England Society for Psychic Research, Curator of Warren Occult Museum and is the owner of the infamous Annabelle doll. How do we fit this conversation into one hour? We couldn’t! We will have him back but we did talk a lot about all things paranormal, including Annabelle! Click HERE to listen to our episode with Tony Spera! Enjoy! EPISODE 18 OF GHOSTBOX RADIO IS NOW AVAILABLE! This week we were thrilled to be talking with Kenny Biddle. Kenny Biddle wrote an article for his blog, I am Kenny Biddle, called Demon House Deconstructed. After attempting to contact the producers of the documentary in February, GhostBox Radio’s Greg Bakun decided to devote an episode to Kenny’s article and also an opportunity to hear what our listeners thought of the film starring Zak Bagans. Kenny Biddle is a science enthusiast and skeptical investigator of paranormal claims. He’s been involved in photography for over twenty years and applies his knowledge, experience, and critical thinking skills to analyzing alleged paranormal photographs and video to determine the most plausible causes. His work investigating ghostly experiences, methodology, and “ghost hunting” gadgets has been featured in several skeptical publications, including the website of the Center for Inquiry. We want opinions on the documentary whether you liked it or not. Click HERE to listen to our episode with Kenny Biddle! Enjoy! EPISODE 17 OF GHOSTBOX RADIO IS NOW AVAILABLE! This week we were thrilled to be talking with Stephanie Burke. Stephanie has been very intuitive since she was a young child, having the gift passed down from previous generations. She has been able to see, hear, feel, and communicate with the other side for as long as she can remember. Having this gift, and growing up in a spiritually active historical home, she thought being surrounded by such energies was in fact normal. Because of this, she developed a love and curiosity for the paranormal and explores it any chance she gets. Stephanie now uses this gift to help others understand that death doesn’t mean the end, but rather a beginning to a new chapter. Along with her mediumship, she’s been practicing Reiki for 10 years. Helping others heal, relax, and regain balance to their energy is what she truly enjoys through her work. 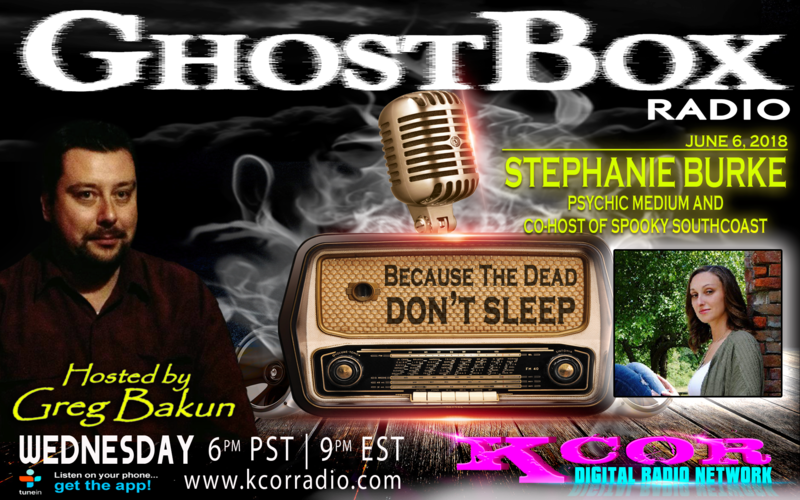 You can listen to Stephanie live on Saturday nights as she co-hosts WBSM’s Spooky Southcoast Radio. Stephanie has made appearances on TLC’s Kindred Spirits, Destination America, and Syfy Channels.This was an amazing hour! Click HERE to listen to our episode with Stephanie Burke! Enjoy! 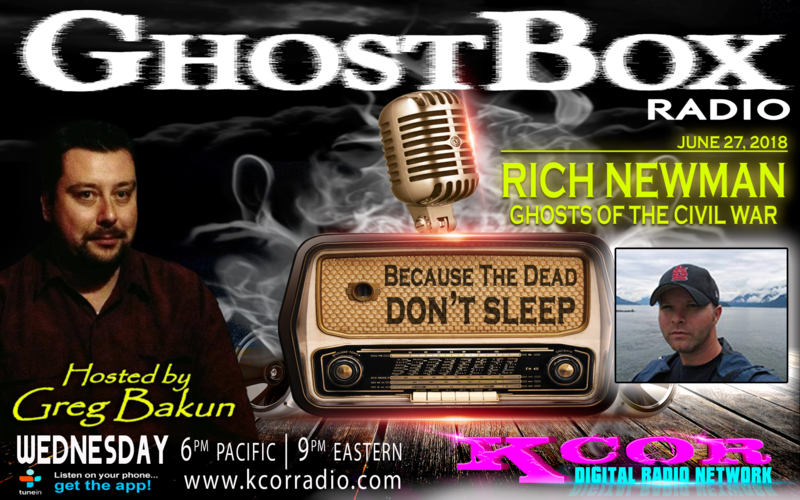 EPISODE 16 OF GHOSTBOX RADIO IS NOW AVAILABLE! We were really excited to be talking with Author Barry Strohm​ who wrote the book, “Spirits Speak of Conspiracies and Mysteries”, the author channels the actual spirits that lived the events to bring the reader the truth behind 27 of the greatest conspiracies and mysteries of our times. We talked about what he found out when channeling the spirits of some of our most influential figures in history to see what took place in some of the most mysterious conspiracies we have known. Among an hour of extremely interesting conversation, perhaps the most interesting is when Barry spoke about waking up to a Reptilian staring at him. Definitely worth listening to this episode and listening to Barry! Click HERE to listen to our episode with Barry Strohm! Enjoy! Episode 15 of GhostBox Radio Is Now Available! This week we were thrilled to be talking with Sasha Klanott who is Host of Haunted Bourbon ParaCon and Half Past Dead and Founder of Paranormal Dolls. Sasha has been seen on travel channel’s “Legends of Alaska” and is Author of “Liability Of A Paranormal Team”. Sasha speaks at conventions to help educate others what she has and still learns. She believes it is vital to teach correct and new information in order to raise the field as a whole. She is always accompanied by her sweet Service Dog Captain Jack! When not Investigating she is a model and crochets items for Para Plushies her own crochet business and always researching. Click HERE to listen to Sasha Klanott! Enjoy! LISTEN TO EPISODE 39 OF MN GHOSTBOX NOW! 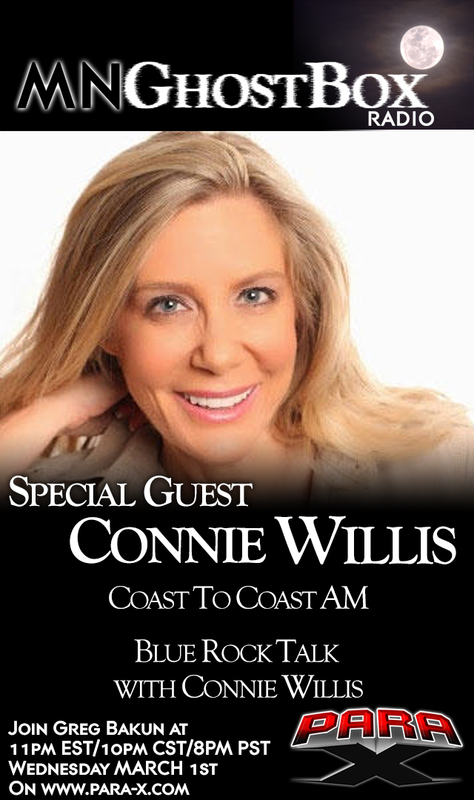 You have probably heard Connie Willis as guest host on the extremely popular Coast to Coast AM but have you checked out her YouTube channel “Blue Rock Talk with Connie Willis”, Earths Most Interesting Conversations! We talked about how her experiences when she was growing up and her interesting perspectives on things like the Paranormal, UFO, and especially Bigfoot. We talked about a lot of varied things. We just run an hour but what Connie does on Blue Rock Talk with Connie Willis is really go deeper into a conversation with her guests. Please listen to our show but please also check out Connie’s show on YouTube in the link below. If you want to listen to previous episodes of MN GhostBox radio, you can do so on or Para-X Radio Page. MN GhostBox Radio episodes are now available on iTunes! Please click this LINK to subscribe and the new episodes will automatically be sent to you! To download an MP3 file of this episode, click on this LINK, it will take you to a new page and click the download button. LISTEN TO EPISODE 37 OF MN GHOSTBOX NOW! 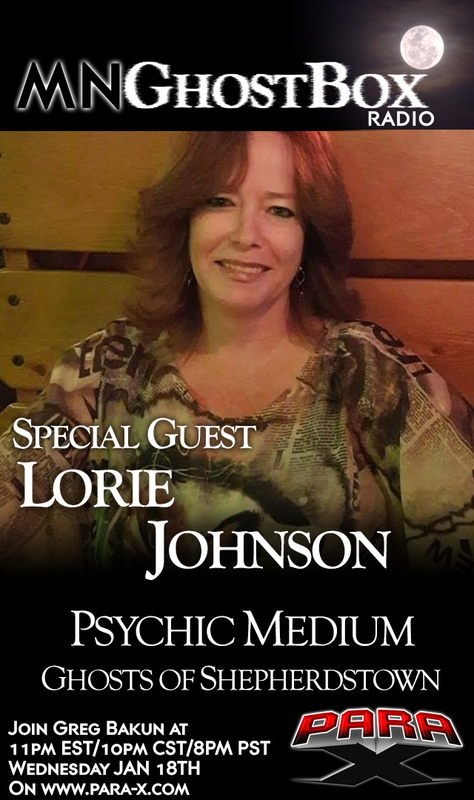 Lorie Johnson is a tremendously gifted Psychic Medium. Lorie is a Psychic Medium, a Clairvoyant, an Empath, Channel, does Automatic Writing, and does Aura Readings. You will have also seen her on the hit Destination America TV series Ghosts of Shepherdstown. Lorie was on the show answering questions about the show and giving insight into her amazing gifts. Although the original idea was for us to take a lot of phone calls for her to give one question readings the phone system was down so Lorie did the readings through the chat room and other private messages. The results were amazing. The hour went by too fast as we barely scratched the surface. LISTEN TO EPISODE 36 OF MN GHOSTBOX NOW! Join a Gothic Curiosity Cabinet’s Todd Atteberry for a creepy holiday tradition as old as the Dickens! 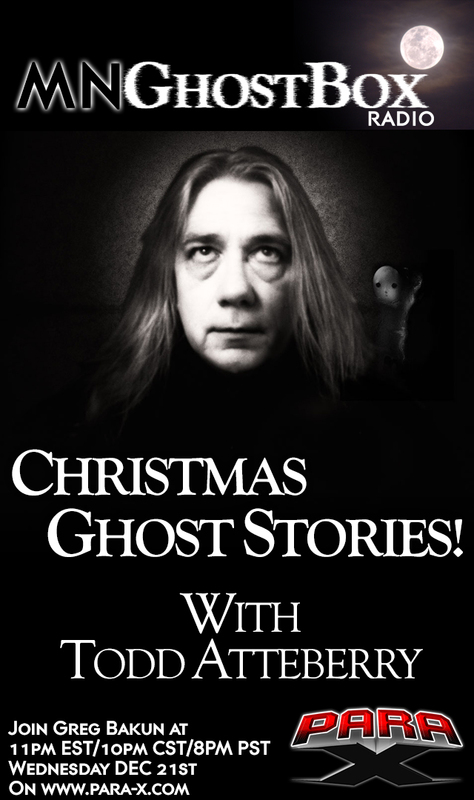 Ghost stories at Christmas? It’s as traditional as Christmas itself, with roots stretching back before the Victorian era where it reached its zenith. Learn what two writers quite literally saved Christmas with their tales phantoms, ghouls and feasts and where to look to find traces of this creepy holiday tradition. This is going to be a fun episode in the spirit of the holidays! Greg Bakun on LISTEN TO EPISODE 36 OF MN GHOSTBOX NOW! Katie Wilkoske on LISTEN TO EPISODE 36 OF MN GHOSTBOX NOW!